Belton is a city in the U.S. state of Texas, within the Killeen-Temple metropolitan area. The city is on the Interstate 35 corridor between Austin and Waco and is the seat of Bell County.The population was 21,734 in 2017 according to a US Census Estimate. As of 2015[update] the metro region had a population of 450,051. Belton was first settled 1850 and named Nolanville, taking the name of nearby Nolan Springs which were named for Texan explorer Philip Nolan. 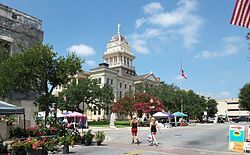 In 1851, it changed its name to Belton after being named the county seat of newly created Bell County named after Texas' governor, Peter Hansborough Bell. In 1860, the population was 300, the largest in the county. During the run up to the civil war, Belton had a large pro-Union minority. A Whig Party paper and anti-secession paper called "The Independent" was published there and the city voted overwhelmingly for Sam Houston for governor, who was strongly against Texas secession. Nonetheless, in 1861 Bell County voted for secession and many residents fought in the Confederate Army. After the civil war, Belton experienced unrest. Several pro-union sympathizers were lynched in 1866 and Federal troops were called in to protect the Federal Judge serving in the city. After reconstruction, the city, close to a major feeder of the Chisholm Trail, served as growing business center for the region. In 1868, Martha McWhirter, a prominent figure in Belton's non-sectarian Union Sunday School, created the Woman's Commonwealth, the only Texas women's commune of the 1800s. The commune started several business ventures including a successful hotel. In 1899, the group sold their holdings and relocated to Maryland. The town experienced rapid growth in the 1880s with the building of the courthouse, Baylor Female College buildings, and a "railroad war" in which, by 1881, Belton was bypassed by the railroad which built Temple as the local junction and depot town. In 1904, the town reported a population of 3,700. The town began to thrive and reached a population of 6,500 in 1928. However the town was decimated by the Great Depression and was down to a population of 3,779 only three years later in 1931. Beach at Belton Lake Outdoor Recreation Center. 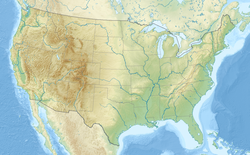 According to the United States Census Bureau, the city has a total area of 20.0 square miles (51.7 km2), of which 18.9 square miles (49.0 km2) is land and 1.0 square mile (2.6 km2), or 5.08%, is water. Belton has a humid subtropical climate under the Köppen climate classification. This climate is typified by hot and muggy summers, short mild winters, and pleasantly warm spring and fall seasons. Belton averages 35.2 inches (894 mm) of annual rainfall and it is distributed mostly evenly throughout the year. The average temperature for the year in Belton is 66.3°F (19.1°C). The warmest month, on average, is August with an average temperature of 83.3°F (28.5°C). The coolest month on average is January, with an average temperature of 47.4°F (8.6°C). Snow is rare in Belton, and ground accumulation even rarer. There's an average of 0.1" of snow (0 cm). The month with the most snow is January, with 0.1" of snow (0.3 cm). Although severe weather can & does occur, typically during the Spring with supercell thunderstorms it does not fall within the conventional limits of tornado alley. Bell County Fair in Belton, TX. As of the census of 2000, there were 14,623 people, 4,742 households, and 3,319 families residing in the city. 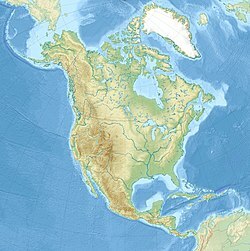 The population density was 1,171.3 people per square mile (452.4/km²). There were 5,089 housing units at an average density of 407.6 per square mile (157.4/km²). The racial makeup of the city was 72.67% White, 8.10% African American, 0.64% Native American, 0.95% Asian, 0.10% Pacific Islander, 14.83% from other races, and 2.71% from two or more races. Hispanic or Latino of any race were 25.13% of the population. There were 4,742 households out of which 37.3% had children under the age of 18 living with them, 49.9% were married couples living together, 16.1% had a female householder with no husband present, and 30.0% were non-families. 24.6% of all households were made up of individuals and 10.6% had someone living alone who was 65 years of age or older. The average household size was 2.69 and the average family size was 3.23. In the city, the population was spread out with 26.9% under the age of 18, 18.4% from 18 to 24, 26.5% from 25 to 44, 17.1% from 45 to 64, and 11.1% who were 65 years of age or older. The median age was 28 years. For every 100 females, there were 95.0 males. For every 100 females age 18 and over, there were 90.4 males. The median income for a household in the city was $32,052, and the median income for a family was $38,635. Males had a median income of $31,304 versus $20,678 for females. The per capita income for the city was $14,345. About 12.7% of families and 17.9% of the population were below the poverty line, including 20.7% of those under age 18 and 14.0% of those age 65 or over. Belton is served by the Belton Independent School District. The school district operates two high schools, three middle schools and nine elementary schools. The district and all of its campuses received the Texas Education Agency's highest accountability rating (met standard) based on student performance on the State of Texas Assessment of Academic Readiness. Both Belton High School & Belton New Tech High School have been included on lists of the nation's best high schools compiled by US News & World Report and Newsweek. Belton New Tech High School and South Belton Middle School have been recognized as Apple Distinguished Schools for their implementation of the district's digital learning initiative. The mascot for Belton ISD is the Tiger. Falling in Temple, TX city limits but within the boundaries of Belton Independent School District is Central Texas Christian School a private Christian k-12 school with an enrollment of approximately 570 students. Belton is home to the University of Mary Hardin–Baylor. Founded in 1845 its is a private Christian university affiliated with the Baptist General Convention of Texas. Awarding degrees at the baccalaureate, master's, and doctoral levels it has an enrollment of 3,898. A water Park named Summer Fun in Belton, TX. The city maintains 13 city parks. Largest among them are Heritage Park, which is along the Leon River. Yettie Polk Park, which winds along Nolan Creek with a walking trail reaching from down and Interstate 35 to the University of Mary Hardin-Baylor, And Miller Springs Nature Center offering hiking trails along the Leon River below the Belton Lake Dam. For recreation, Belton has two major lakes: Belton Lake on the Leon River, and Stillhouse Hollow Lake on the Lampasas River. Belton Lake has 11 public access parks owned and maintained by the United States Army Corps of Engineers. Stillhouse Lake has four with lake access. These parks offer many amenities such as boat docks, picnic areas, hike and bike trails, camping sites, public restroom facilities, marinas and designated sandy swimming beaches. There is also a water park, Summer Fun Water Park. George Eads, actor, graduated from Belton High School. J. Evetts Haley, political activist and historian, was born in Belton and is buried in the Moffat Cemetery. George Jo Hennard, mass murderer, and perpetrator of the Luby's shooting. Henry T. Waskow, the basis of a famous article by Ernie Pyle, was a Belton native. ^ "Table 1. Annual Estimates of the Population of Metropolitan and Micropolitan Statistical Areas: April 1, 2000 to July 1, 2009 (CBSA-EST2009-01)". 2009 Population Estimates. United States Census Bureau, Population Division. 2010-03-23. Archived from the original (CSV) on 2010-06-15. Retrieved 2010-03-25. ^ "Handbook of Texas Online-Bell County". Retrieved June 27, 2017. ^ "Handbook of Texas Online". Retrieved June 27, 2017. ^ "Distance from Belton, TX to Austin, TX". trippy.com. Retrieved 2019-01-11. ^ "Distance from Belton, TX to Dallas, TX". trippy.com. Retrieved 2019-01-11. ^ "Distance from Belton, TX to Houston, TX". trippy.com. Retrieved 2019-01-11. 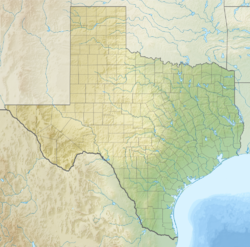 ^ "Texas Ecoregions". tpwd.texas.gov. Retrieved 2019-01-11. ^ "Belton TX Lat Coordinates". latlong.net. Retrieved 2019-01-11. ^ "Geographic Identifiers: 2010 Demographic Profile Data (G001): Belton city, Texas". U.S. Census Bureau, American Factfinder. Retrieved April 10, 2014. ^ "Belton Texas Weather Summary". weatherbase.com. Retrieved 2019-01-11. ^ "Catholic Online, Nov. 6 2009". Archived from the original on 2011-06-06. Retrieved 2010-03-22. Wikimedia Commons has media related to Belton, Texas. This page was last edited on 10 March 2019, at 22:17 (UTC).